Sample some French-style, Spanish-influenced sparkling wine (yep, that’s a thing!) made in Sonoma County, California at Gloria Ferrer. Nestled in the cool bayside Carneros region of Sonoma County, the vineyards of Gloria Ferrer are well situated to grow Chardonnay and Pinot noir grapes, the key components of most sparkling wines. Having visited nearby Domaine Carneros just across the Napa County line, I had wanted to try Gloria Ferrer. The winery is a venture started by the Ferrer family, which grew Freixenet in Catalonia into one of the most prominent Cava houses in Spain in the past century. For those that haven’t had much exposure to Cava, it is a sparkling wine made in the champenoise style and made primarily from Chardonnay and Pinot noir grapes -sometimes, juice from other grapes, like Spain’s Xarello, may be blended in. Gloria Ferrer’s tasting room is hard to spot from highway 121 (which, annoyingly is still only a two lane road, which really cramps my style when heading to Napa), but its cheery stucco walls and red Spanish roof tiles are a comforting indication of the sparkling house’s Spanish roots. Tasting outdoors on the sizeable patio is a must when the weather cooperates. 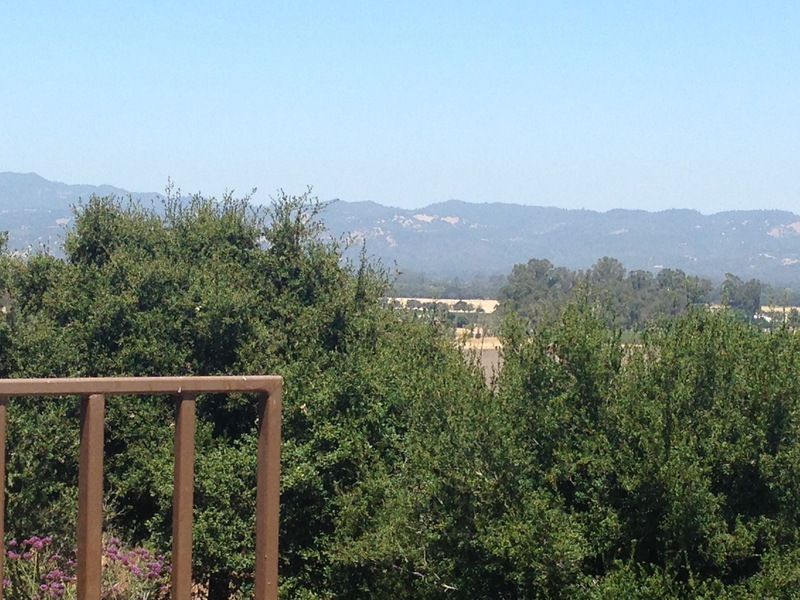 Sunshine and a better than expected view of the Vaca mountains that shield Napa and the rest of the region from the (worst of the) inland heat. Gloria Ferrer’s specialty is sparkling wine; however as is typical for American sparkling wine producers, it also makes still wines. One aspect I loved about the winery’s tasting room was that one could also try wines from its Spanish and Australian wineries – a nice change of pace when you are a frequent visitor to California wineries. At the tasting room, wines can be sampled by the glass, bottle, or one of five tasting flights. The tasting flights include two sparkling only flights, one still flight, and two mixed flights, each consisting of 3-4 different wine samples. I chose the 90 point flight, which is one of the two all-sparkling flights. This flight started off with the extra brut, which was lemony and crisp from its Chardonnay grapes. It wasn’t the most complex of wines, but sparkling wines often aren’t. Sweet berry notes, but the fruitiness of the Pinot noir was a bit more subtle than other houses’ varieties. As a brut, it was crisp and dry, a pleasant aperitif. Next on the list was the royal cuvée, a source of pride for the winery. I wasn’t quite so impressed with it, as it just felt heavier, and our bottle may have gone a bit flat from an earlier opening. But the memory also quickly disappeared after our final wine. The Va de Vi was fantastic. With a small amount of the aromatic Muscat grape blended into the two usual suspects, it was more complex than the other three. In addition, though a small enough dosage (sugar and yeast mixture added to the bottle for second fermentation) was added to qualify it as a brut (dry) wine, had a touch more sweetness than the other three. That hint of extra sweetness nicely balanced the citrus tang of the wine. It was by far all of our favorite. Other friends, not fans of bubbly, opted to try one of the Spanish Ferrer family wines. Their chosen Morlanda wine is a blend of Garnacha (Grenache) and Carineña (Carignan) from the rocky, austere Priorat wine region of Catalonia. It was a smooth balance of fruit and tannins. In any tasting experience, service is key. Our server, Diego, was friendly and happy to share wine knowledge yet left our group free to enjoy our sunny midday tasting and company of friends. I’ll be back!